mature pleasure (light activity) and performance (moderate activity) horses. 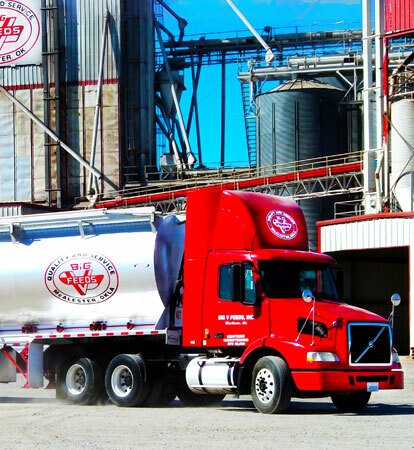 Vitamin A, Min ..........………..….…............. 6,000 IU/lb. Vitamin D, Min ……………………..……........... 500 IU/lb. Vitamin E, Min …………………..….…….......... 130 IU/lb. Vitamin C (Ascorbic acid) ...........…………….. 64 mg/lb. Biotin, Min ………………………...……........... 0.60 mg/lb. Alfalfa Meal Dehydrated, Wheat Middlings, Soybean Hulls, Rice Bran, Soybean Meal, Beet Pulp, Corn, Flax Seed Meal, Cane Molasses, Soybean Oil, Rice Mill By-Product, Calcium Carbonate, Monocalcium/Dicalcium Phosphate, Yeast Culture, L-Lysine, DL-Methionine, Salt, Dried Bacillus Licheniformis Fermentation Product, Dried Bacillus Subtilis Fermentation Product, Sodium Silico Aluminate, Ferrous Sulfate, Vitamin E Supplement, Choline Chloride, Zinc Hydroxychloride, Zinc Sulfate, Zinc Methionine Complex, Manganese Hydroxychloride, Manganese Sulfate, Manganese Methionine Complex, Basic Copper Chloride, Sodium Selenite, Copper Sulfate, Copper Lysine Complex, Niacin Supplement, Thiamine Mononitrate, Biotin, Vitamin A Supplement, D-Calcium Pantothenate, Folic Acid, Riboflavin Supplement, Pyridoxine Hydrochloride, Vitamin D3 Supplement, Vitamin B12 Supplement, Ethylenediamine Dihydroiodide, Cobalt Carbonate, Cobalt Glucoheptonate, Menadione Sodium Bisulfite Complex, Ascorbic Acid, Natural and Artificial Flavors. Horses should consume a ration of long stem roughage (hay) equaling 1 to 1.50 lbs. per 100 lbs. of body weight daily. Feed at a regular time each day and split feedings into two separate feedings. Do not feed more than 0.5% of body weight at each feeding. If you are feeding more than 0.5% at each feeding switch to three feedings per day. Provide free choice fresh, clean water at all times except to hot horses that have been exercised. 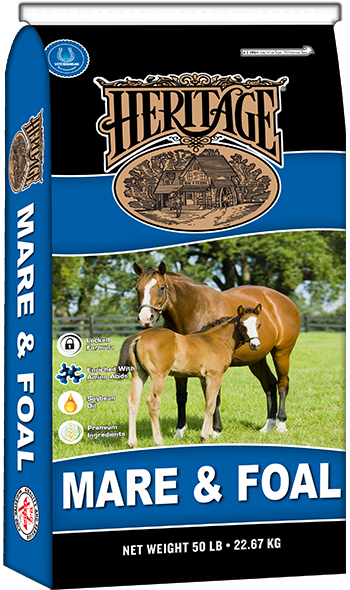 Offer salt free choice at all times and Heritage horse mineral can be fed if desired. 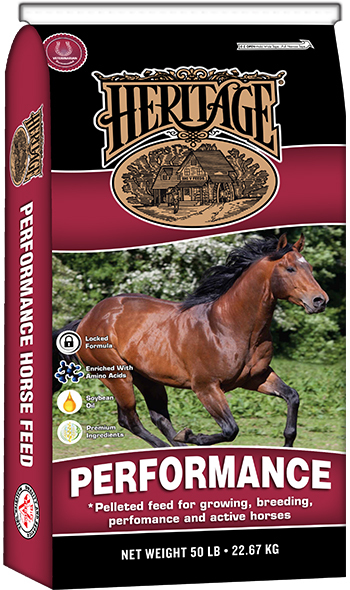 Bring horses on to this feed gradually over a 10 day period to give the horse’s digestive system time to adapt to the new ration. 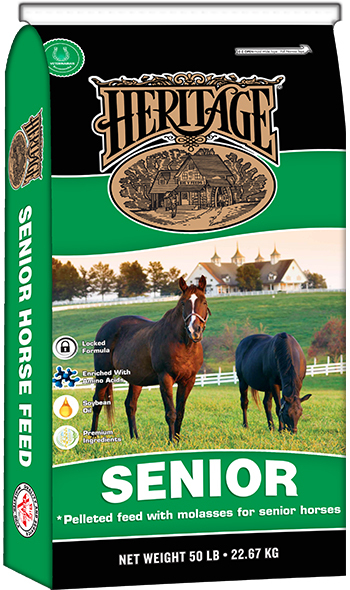 Do not feed growing horse excessive amounts that would produce overweight weanlings/yearlings. 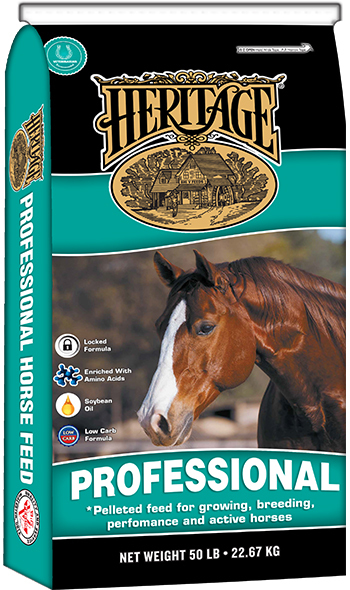 The feeding charts are intended as a guide for feeding Heritage Senior 14% Horse Pellets. If hay is used, reduce amount of feed 1 poundfor each 2 pounds of hay fed. Weanling & 4 months 400 lbs. Weanling & 6 months 500 lbs. Yearling & 12 months 720 lbs. Yearling & 18 months 800 lbs. Two year olds 1,000 lbs. Hay can be fed to growing horse but don’t feedmore than 6 lbs. of hay/day. and it is only as effective as the quality of management practices.